I've been looking for a good quality diver's watch for quite some time. In my current situation a Rolex Submariner isn't really an option, so I've been looking into other options that would still give me a wellmade automatic diver that looks great and will last. After a long search and weighing of different options this is what Fedex brought me yesterday. An Armida A2 500. A proper text with a lot of photos will follow this or the next weekend, but first impression is that it's truely what I was looking for. A beautiful piece and seems like pretty fantastic quality for the price. Nice one! 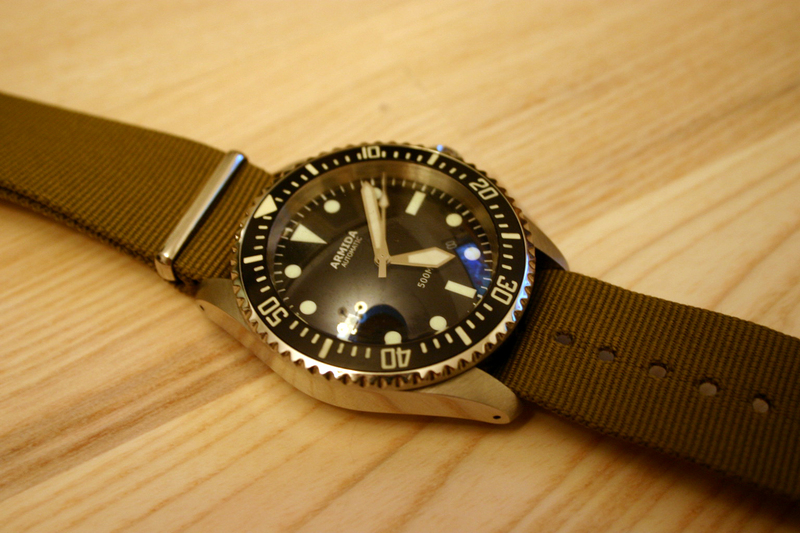 Take a look at Steinhart, I have a diver from them and it is of great quality. It also has a swiss ETA inside which is really great for 350 euros or so. Anyway, after wearing this for two days I must say I'm happy I picked the Armida. The Seiko SKX007 is a nice piece! Premium japanese automatic watch. I also wear Armida which has been one of my best buys ever. Good to hear. Which one do you have? That seems like a nice milsub! Did you buy it from Armida website? It is and yes, I did. Now on my wrist on a navy NATO. I chose a Longines Legend Diver with a NATO stripes black and khaki .... and it looks great!